The Rimini Fair is pleased to present the 40th International Exhibition of Ice Cream, Pastry, Bakery and Craft Coffee ( SIGEP) which will be held in the large exhibition halls of the Rimini exhibition complex from 19 to 23 January 2019. SIGEP is an extraordinary review dedicated exclusively to professionals who anticipate trends and innovations of the 5 supply chains on display. Are you also part of the great ice cream business? 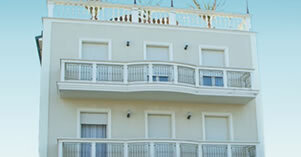 Then the SIGEP Rimini Offer proposed by our Business Hotel in Torre Pedrera seems made just for you! Discover all the details of the Hotel Villa Paola offer : located close to the Fair (only 3 km) and equipped with excellent services for business travelers, such as parking and Wi-Fi , our hotel can not wait to welcome and pamper yourself! - Your king's breakfast at Torre Pedrera: delicious homemade cakes, nutella crepes, biscuits and croissants for Italian breakfast fanatics; cereals, fruit and yoghurt for those who are attentive to the line; meats, cheeses and eggs for lovers of savory breakfast. All accompanied by milk, juice, tea and espresso coffee.